If you’ve noticed that your northern Virginia home may be in need of foundation repair, you’ve come to the right place. No matter what your foundation problem, we are here to help you. We’ll answer questions, use high-quality materials, and hold a high standard of workmanship. Foundation problems not only threaten you and your family’s safety but the value of your home. Our homes are a huge investment. Structural damage can put your home’s value at risk. If you’ve noticed things like bowing walls, cracks, or uneven floors, give us a call now. We want to help you maintain the highest value of your home. One of the biggest problems with foundations is the fact that the longer they sit there, untouched, unnoticed, and unfixed, the more they cost to repair. A small problem can become a big problem, just as a seemingly harmless thing can hide something much worse. It is important to contact your Virginia foundation repair team at Reliable Waterproofing & Masonry to diagnose your foundation problems. Soil-related problems such as poor compaction, overloading, poor waterproofing, excessive organic materials, erosion or expansive soils that expand and shrink with changes in the moisture content of the soil can all contribute to foundation issues. 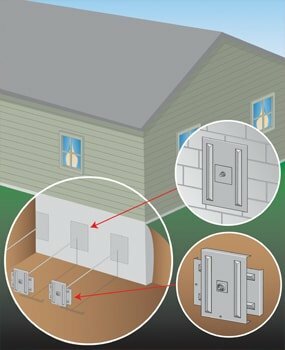 You may have a crawl space, slab on grade, or a basement made of poured concrete or block that needs foundation repair. Using our professional products from Earth Contact Products (ECP) like steel piers, helical anchor piers, porch piers, tieback anchors, retaining wall tiebacks, plate anchors, and hydraulic lift slab piers, we’ll make your home’s structure as strong as ever with our foundation repair services. The best solutions to foundation problems are most likely going to be steel piers, also called push piers or helical piers. These piers are made of steel and they’re long beams which are driven into the ground and support your foundation by transferring the pressure from your foundation and soil to an under-layer of the earth that can support the weight easily. These piers are easy to install and can be implemented year-round. The installation process can be done without damage to your lawn and they can also be installed in tight, hard-to-reach places. We offer free estimates for our foundation repairs in Northern Virginia so that you can know ahead of time what your foundation repair job will entail. We know that your house is your biggest investment and will treat it as such. We know that every foundation and home is different and so each foundation problem requires a specific solution tailored to those needs. Call us today to find out how we can help you with your foundation repair needs in the Richmond, Virginia area.